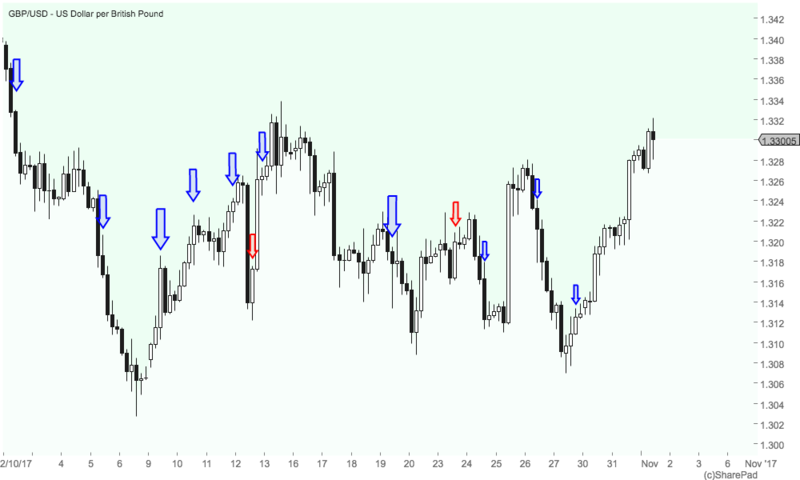 Here is the 4 hour trading system that I promised you in my last post. This system is so simple to use you might not believe that it could even be so profitable. But the results that I’m about to share with you will clearly prove otherwise. I had noticed that there may have been an opportunity to develop some kind off trading system using 4 hour candles way back at the beginning of the year, although I just didn’t have the time to follow up. However, due to the house move stalling I have actually had a chance to finish of the test and give you some results. What is the 4 Hour Trading System? The 4 hour trading system is a binary trading system that relies on following the trends that the 4 hour candle charts make. The reason it works so well and is so simple is that it is actually trend trading in nature and the trade entry couldn’t be easier to identify. Before I go into detail, let me share last months results with you. So, out of the 6 major currency pairs, there was a total of 74 trades. Of these, 54 were winners with 20 losing trades. This equates to, 74 bets total, 54 winners, 20 losses = 73% Strike rate, well just a smidgen under. As you can see, the system generates quite a few trades. So out of the 22 trading days in October 2017 that gives us an average of just over 3 trades a day. So, if you are looking for a reliable system that gives you a good few trades a day, with an awesome strike rate, that you can start trading with minimal investment, then my 4 hour trading system might be just right for you. Why am I Giving You this for Free? Well, I wanted to give this to you at Christmas as a thank you for reading my blog. Then it occurred to me that if I gave it to you at Christmas you’d probably not start using it until well into February once you had giving it a good test. So to give you the heads up and the best chance of starting 2018 with a winning formula, I thought I’d give it to you now. And as you hopefully already realise, I want to over deliver and give you the absolutely best chance of making money from trading. I genuinely mean that. This system is also so easy to use that it won’t take up too much [if any] of my time giving support. Other trading systems that I may offer you, like my binary trading package, are more technical in nature and offering support is to be expected, however time consuming it may be. Also, products like my trading system enable you to set your own hours to trade and also set alerts as and when to trade. So the whole thing is more complex. So enough talk… here are the 4 hour trading system rules. I do not know of this strategy being published online anywhere. However I must state that I do not stake any claim that it is solely my creation… although it probably is. You are looking for 2 four hour candles that are of at least the same size or ideally increasing in size. The candles need to be trending… Do not try to trade sideways markets. Good times to enter are therefore obviously in clear trends, after a correction or at reversal points. Also make sure the candles that have formed are of reasonable size in points. Some currency pairs differ in they way that their points are calculated, but as a basic guideline, you want your first 2candles to be at least 8-10 points in size. Once you have identified the candles, you then open a trade for 4 hours on binary.com at the very start of the opening 3rd candle. That is the system in a nut shell. The reason that it works so well is that you are just jumping on to the trend after it has been confirmed by the 2 previous 4 hour candles. If you didn’t want to do any other analysis then the above rules will serve you well enough. However, if you want to spend a little bit of time trying to increase strike rates by finding better entry points then here are the price action rules that I have been using. As you can see from the following chart images, I have not used any technical indicators at all. The charts are completely clear, they are naked. This means that you are only using the price to identify the market direction. What we can use to give some extra conviction to our trades though are candle formations that signal a change in direction or even a continuation after some consolidation or correction. Using support and resistance lines are also super effective. Looking at this zoomed in section of the USD/JPY the results and trades of the 4 hour trading system can be interpreted like this. Please note…. These are my own personal views on what I see happening. I am not stating these candle entry’s as fact. The best, clearest most perfect trading setup in the world can still go belly up. The first blue arrow you can see on the chart signifies a winning trade on the 6/10/2017 [it looks like it is above the 4th candle in the sequence]. The very first black candle in the sequence seems to have been formed at a resistance level, thus the price has started to move back down. The second black candle has had a lot of pressure from the bulls driving the price up during the formation of the candle. This is clear from the long wick. However, the bears have won the battle and pushed the price right back down to form another downward bear candle. This suggest to me that there is plenty of selling pressure and that there is a good chance of the next 4 hours seeing the price move down further. 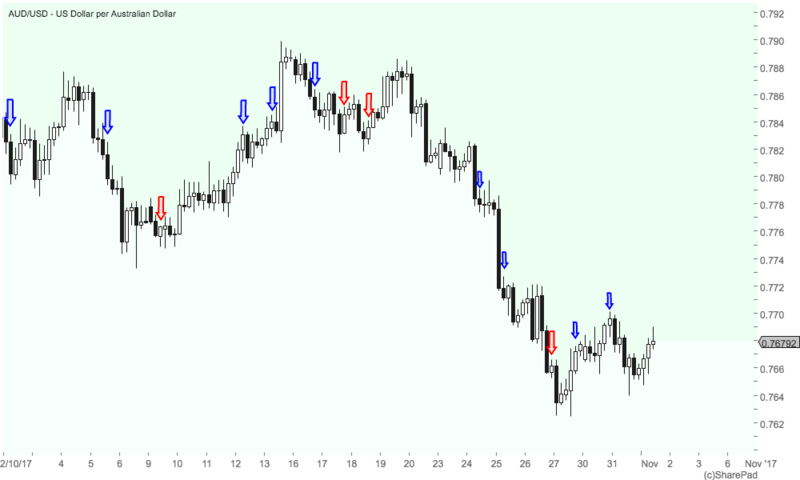 This is a good place to open a trade ‘lower in 4 hours time on binary’. The price moved down for the next 8 hours. The candle before the first black candle is what is considered a spinning top. These spinning tops can often mean indecision in the market, a continuation of trend after a price correction or even a change in direction depending on where they form. The following 2 black candles are clearly quite bearish and we can assume that the price will continue moving down. We enter a trade at the very start of the candle that is after the close of the second long bear candle. This trade finishes in a another winner. I didn’t have any reason to doubt that this setup qualified as a trade. The first black candle engulfs the preceding white candle and also seems to have come up against and met a resistance level as did the previous white candle. The second candle continues in the main down trend direction. The candle has just about a longer top wick than a bottom wick and this means to me that price is likely to continue down. We will open our trade at the start of the next candle. The third candle actually doesn’t behave like we think it should and we lose the trade. This trade is very clear to me. There has been a strong support level around the 12.1 / 12.2 area. This coincides with the formation of a doji candle and then a spinning top which is the start of our sequence. The next candle after the spinning top is a huge bull candle that clearly outsizes the spinning top. I trade at the start of the next 4 hour candle. The result is another big bull candle and another winning trade. As you can see, I have only used some basic price action analysis to confirm to me that I should place a trade. If you can’t fathom price action [although you really need to do so to become a successful trader] you can always just place the trade on the start of the third 4 hour candle if the previous 2 candles are increasing in size. Doing so will give you more trades, but will also increase both the amount of winners and losers. Although overall results will not be to far from the results using some basic price action analysis the strike rate does dip. Simplicity… that is one of the key components of this system. In fact, it is so easy to use that a few minutes evaluation of a chart is all that you will need to do once you get the hang of things. It’s important to understand that you do not need to try and make this system more technical in nature to make it work. You are simply jumping on the trend that is already in place. 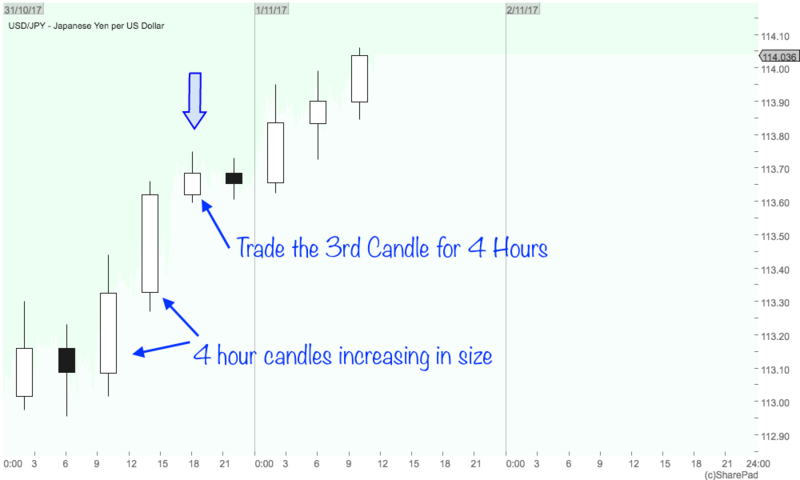 The size of the 4 hour candles is [in their most basic form] all that you need to identify a trend and potential trade. Realistically, you can trade in just the most liquid trading hours by setting alarms on your phone every 4 hours. 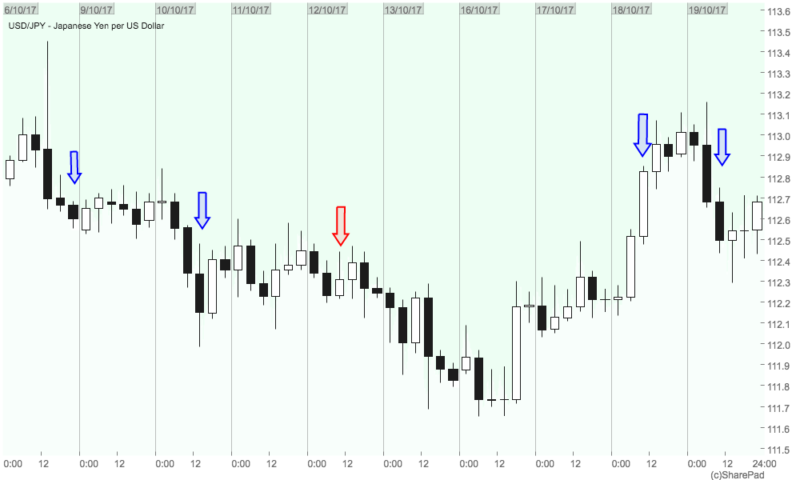 As an example, if the chart package you use coincides with candles forming at 8 am, 12 noon, 4 pm and 8 pm…. Just set an alarm on your phone that goes of every 4 hours at a quarter to the start of the candle. So 7.45 am, 11.45 am, 3.45 pm and 7.45 pm. This then gives you enough time to get to your PC or get on your mobile and take a look at what is happening with the charts. You can set trading alerts on the IG platform that can notify you of certain movements and indicator signals. I cover this in detail in my binary trading course. Basically though, you can set up an alarm that will notify you of any continuous 4 hour candles. For example, if you are trading the USD/JPY you set an alarm on the platform by clicking alerts in the top right hand corner. Click add alert and then set up the continuous candle alert. The Alerts will then be emailed to you or pushed on your Iphone. This image beneath is taken from IG Charts. Adding an alert is very easy to do. 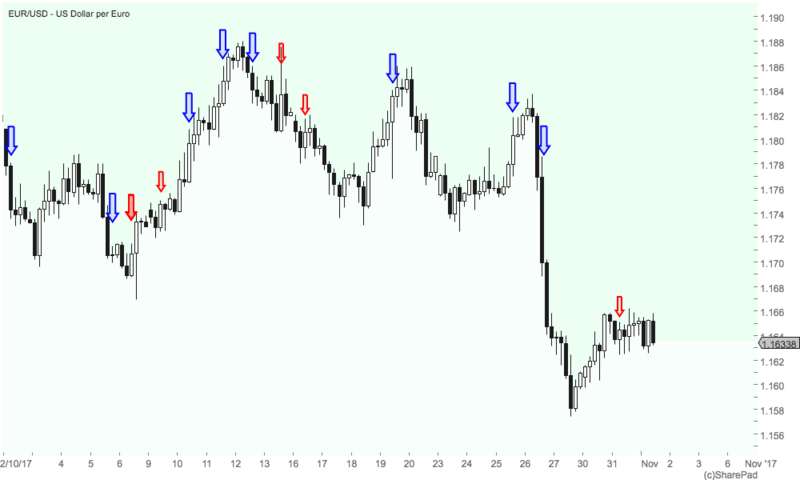 Have a look at these other 4 hour charts, these are all of the major pairs charts that I analysed last month and all the wins and losses that I encountered. If you take time to really study them you will probably, criticize me on some of my entry points and price action analysis. That however is actually a good sign… it means you are truly considering the movement of the prices. We are not all going to agree on where we think the price is going to go. That is what makes the market in the first place… the bulls and the bears. 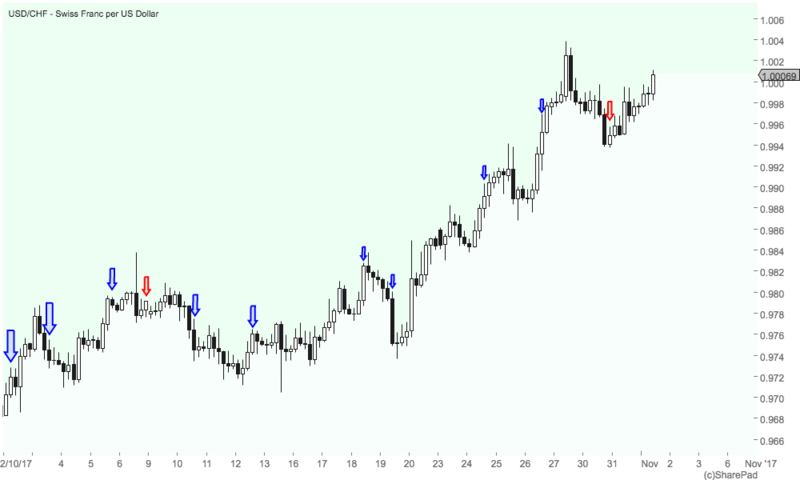 Trade the 3rd candle if the previous 2 candles are at least the same size or ideally increasing in size. 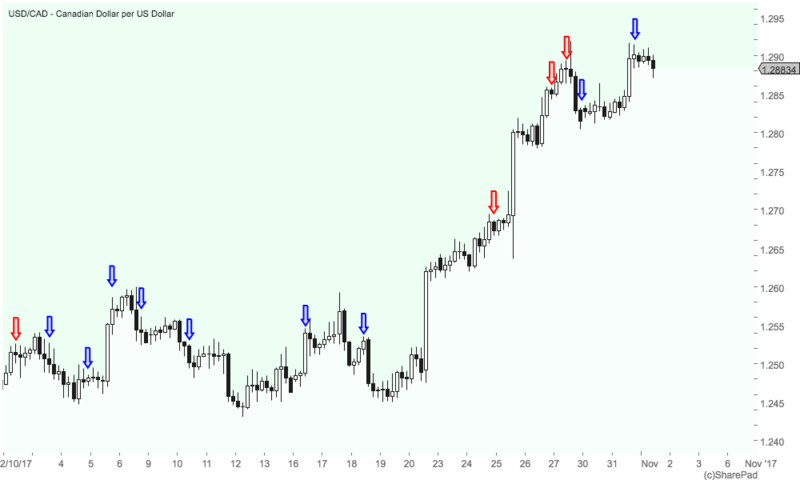 Use simple price action, including support and resistance levels and candle formation to fine tune entry points. Don’t underestimate how simple and effective this system is. So from here until the New Year I suggest that you paper trade the system so that you can get to grips with the selection process. You can open an account at IG or anywhere that you can use some good reliable charts if you haven’t already. Don’t break the rules and just do what I have outlined in the 4 hour trading system rules. Keep a spread sheet to record your results and you can get a clear idea of what is going on in the blink of an eye. Remember that some of the currency pairs will perform better than others. What counts are the result overall on average each month.